An urgent, essential collection of stories about immigration, broken dreams, Los Angeles gang members, Latin American families, and other tales of high stakes journeys, from the award-winning author of War by Candlelight and At Night We Walk in Circles. Migration. Betrayal. Family secrets. Doomed love. Uncertain futures. In Daniel Alarcón’s hands, these are transformed into deeply human stories with high stakes. In "The Thousands," people are on the move and forging new paths; hope and heartbreak abound. A man deals with the fallout of his blind relatives' mysterious deaths and his father's mental breakdown and incarceration in "The Bridge." A gang member discovers a way to forgiveness and redemption through the haze of violence and trauma in “The Ballad of Rocky Rontal.” And in the tour de force novella, "The Auroras", a man severs himself from his old life and seeks to make a new one in a new city, only to find himself seduced and controlled by a powerful woman. 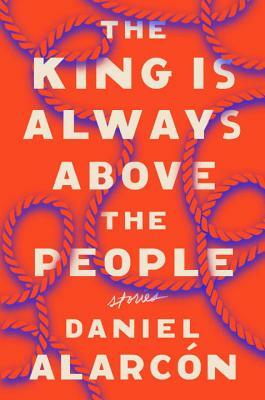 Richly drawn, full of unforgettable characters, The King is Always Above the People reveals experiences both unsettling and unknown, and yet eerily familiar in this new world. Daniel Alarcón is the author of At Night We Walk in Circles, which was a finalist for the 2014 Pen-Faulkner Award, as well as the story collection War by Candlelight, the novel Lost City Radio, and the graphic novel City of Clowns. His writing has appeared in the New Yorker, the New York Times Magazine, Granta, n+1, and Harpers, and he was named one of the New Yorker’s “20 Under 40.” He is Executive Producer of “Radio Ambulante,” distributed by NPR, and is an assistant professor of broadcast journalism at the Columbia University School of Journalism in New York.